To cook the chicken - Preheat oven to 375. Line a baking dish with aluminum foil. Place breasts in dish in one layer and lightly cover with aluminum foil. Bake for about 30-40 minutes (depending on whether or not they're frozen). Remove from oven and let cool. When cooled, shred the chicken with your fingers. To make the enchiladas - Turn down oven temp to 350°F. In a skillet, heat the oil over medium-high heat until sizzling hot. At the same time, heat the tomatillo sauce in another skillet over medium-high heat. Using tongs (or your fingers, which seems to work better for us, to prevent tearing of the tortilla), carefully and quickly pass each tortilla through the hot oil to soften, then drain on paper towels. Make sure the oil is hot enough as this will prevent the tortillas from tearing when you are assembling the enchiladas. Using your fingers, dip each tortilla briefly in the warm tomatillo sauce, place on a plate, put a large spoonful of shredded chicken near one edge and roll up the tortilla. Place, seam side down, in a large baking dish. Repeat with remaining tortillas, arranging them snugly in the dish. Cover with the remaining sauce. Bake until thoroughly heated, about 10 minutes. 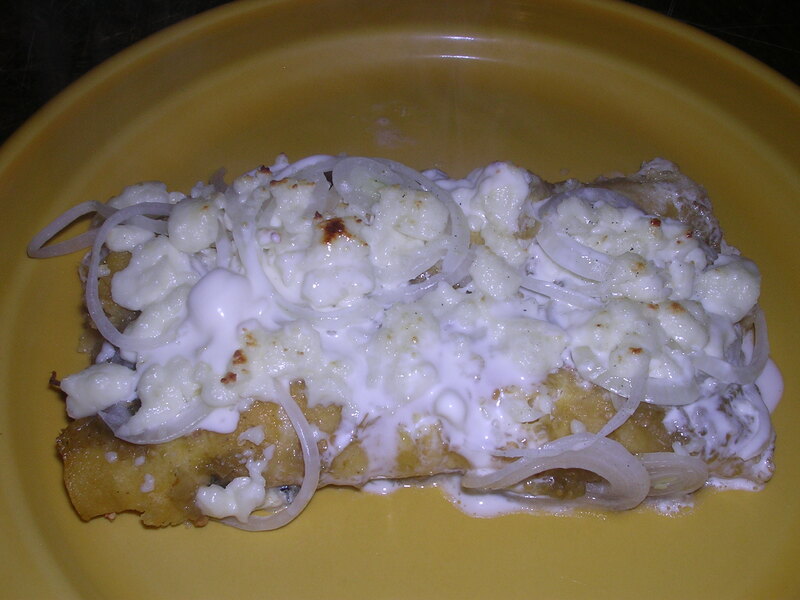 Remove the enchiladas from the oven and generously top with the onion slices and crumbled cheese. Place back in the oven and broil until cheese begins to melt and slightly brown. Remove from oven and top generously with creme fraiche. Serve immediately—enchiladas become soggy quickly. Serves 6.